The new modern way to obtain spa pedicure results is to use the only callous removal product that is an Approved Medical Device; that product is MAVEX Calluspeeling. Gone are the days of needing to soak for 10 minutes, and put your back out filing for another fifteen minutes after that! With MAVEX Calluspeeling it isn’t necessary to soak the feet before… just apply the product straight away. The process for MAVEX Calluspeeling is quick and simple as well as being highly effective it is also a fantastic time saver for busy salons. With the right salon set up, it is possible to complete as many as four or five beautiful pedicures in under an hour with just one therapist! 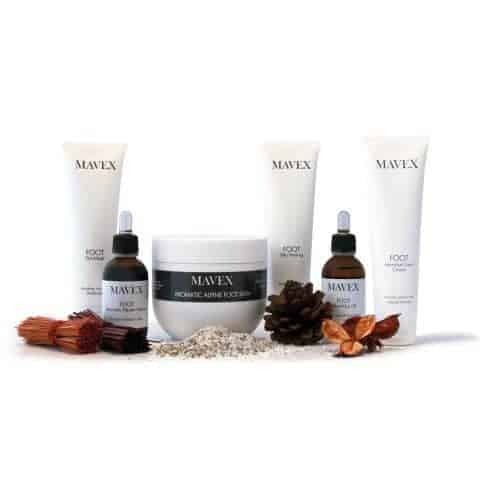 The possibilities (and profit) for your salon or spa are huge, with clients returning to salons again and again because they love the results of a MAVEX Calluspeeling treatment, and they tell their friends. The treatment is also great for those salons looking to tap into the lucrative male grooming market. Many a salon owner has told of their female clients sending in their husband for a MAVEX Swiss Pedicure. You then have that new client in the chair, which is a great opportunity for education and introduction of other treatments and products. MAVEX Calluspeeling is a unique combination of natural highly active ingredients that softens the dead, hard skin and turns it into ‘mush’. This ‘mush’ can then be scraped away with a simple plastic tool, before a polish with the file tool then a massage with MAVEX Daily Care Foot Cream. This foot cream is specially designed for the tougher skin on the feet, to keep them moisturised and free from callouses and cracks, and can be retailed for clients to prolong the results of their pedicure. MAVEX will be exhibiting at Olympia Beauty on stand B39. To find out more about what they will be exhibiting go here.